In the year 2000, at the dawn of the new millenium with the PlayStation 2 being the hot new thing on the shelves, the gaming industry itself had been slowly adapting to a world of 3D games. These new games allowed truly interactive worlds to be created and explored, as opposed to the blockier 2D games of the previous generations (not that there is anything wrong with pixel art, of course). There was a problem, however. With no steady flow of competent developers, the Swedish game industry had a hard time growing too much further, and there were few indie developers since nobody knew the ropes. This is where our tale begins. 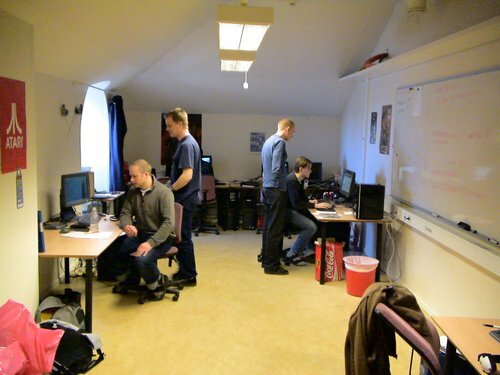 With the ambitious goal of providing top-notch talent to the games industry, PlaygroundSquad opened its first doors in an old miltary facility in Falun, Sweden. Clearly there was something to this concept, as the first cohort accepted to PlaygroundSquad consisted of 25 students ready to fight their way into the industry some of them are in leading positions within the games industry today all over the world. Today, PlaygroundSquad has had over 500 graduates in the areas of game design, game programming and game art - and with plenty more on the horizion. Continued trust from companies in the industry, students, and alumni has allowed PlaygroundSquad to thrive and adapt itself to the ever-changing conditions of an evolving industry. We're passionate about games. Wanna join us?